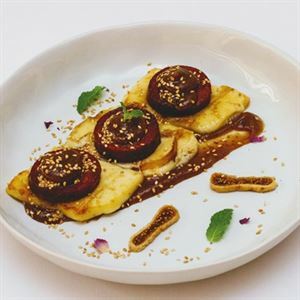 Soujouk Halloumi: Turkish garlic sausage, halloumi cheese and sesame fig puree. 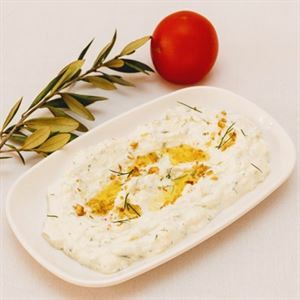 Just like its owners, Olive Thyme Turkish Cuisine on Sandgate Road in Albion is where Turkish tradition meets modern inspiration. Nestled in a beautiful heritage-listed 1920s building, this restaurant has a warm, welcoming ambiance of polished wood floors, intimate table settings clothed in white linen and walls adorned with colourful china plates. In true Turkish style, a centrepiece counter displays tempting entrée platters and desserts so guests can take a peek before ordering mezze plates like Mediterranean octopus, butter beans, capers and grapefruit dressing. Opt for a char-grilled tender chicken pide straight from the oven, or perhaps share thyme seasoned lamb cutlets, rice, greens, tomato sauce and garlic yoghurt; before indulging in hand-rolled hazelnut baklava and artisan gelato. I have been there two nights ago. Im stiil under impression. How beautiful restourant and foods. You are just amazing Olive Thyme!!! The food, wine and service was very special. My son just loved the ‘Lamb Cutlet’ and ‘Taze Fazulye’ was so delicious and tasty. The Meze plate was absolutely divine with the rich flavours. I don’t think you can find the same taste anywhere else in Brisbane. Service was also very attentive and welcoming. Finishing with chocolate brownie with icecream was such a great idea. Many thanks to Sibel and Yalcin for sending us home with a good taste in our mouth. Private deck at the back is great for big functions if you want amazingly delicious food and great space, family friendly with enclosed kids play area and a devine menu that suits all dietary requirements and budget. Amazing Worker and beautiful dishes! Olive Thyme has the best Turkish food I have ever eaten! Truely amazing hospitality, cultural real taste and unique place ! You won’t find better, I’m still in shock at how good it is!